When, Madison Vorva and Rhiannon Tomtishen, both age 12, learned about the problems palm oil caused for orangutans, they refused to keep selling palm-oil containing Girl Scout Cookies. It is very impressive for such young girls to stick to their beliefs and stand up to such a big organization. 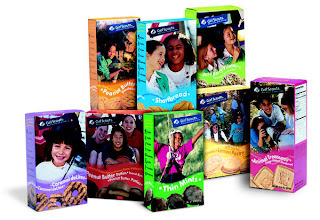 Even when Lisa Raycraft, the director of funds for the Girls Scouts, said how vital cookie sales were to the Girl Scouts and when ABC Bakers, the cookies baker, claimed they would use as little palm oil as possible - the girls were still not satisfied and would not take part in selling the cookies. 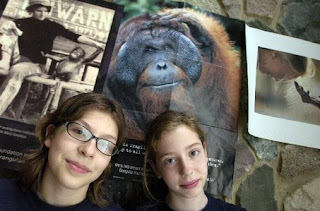 Instead the girls started their own website to educate people about orangutans and the problems with palm oil. 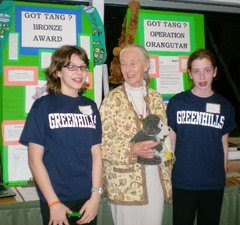 Because of their efforts to protect orangutans, Madison and Rhiannon got the opportunity to meet renowned primatologists Jane Goodall (pictured above). They even got Dr. Goodall to sign their petition against palm oil. They became part of Roots & Shoots, an environmental program for youth started by Jane Goodall. The girls are going to be able to give a presentation about the effects the palm oil industry has on on orangutans before the start of next years cookie sales. Hopefully, the Girls Scouts organization will learn a lesson from these girls and stop using products with palm oil as fundraisers. Since cookies sales is such a girl scout tradition - they should convince ABC bakers to use a different oil in their cookies or go to a different baker. Until then, we should all be inspired by these girls - and think twice before buying our next box of thin mints. Please note the popcorn that boy scouts sell as a fundraiser also contain palm oil. I was really angry about it when I first realized that but didn't have the heart to tell the eager young scouts. 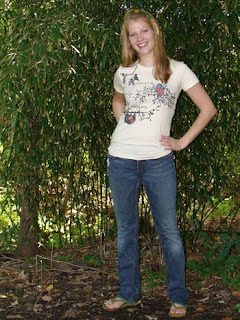 We contacted the girls through their website and hope to send them both one of our "Peace, Love and Orangutan" shirts. cottonseed oil with TBHQ for freshness" which means it may or may not include palm oil. Soybean oil isn't any better for the environment. Production of soybean oil is leading to major deforestation in the Amazon and South America.